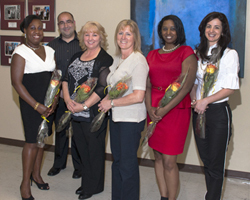 Neuroscience Nursing Awards of Excellence are awarded each year during National Nursing Week in May to nurses working at The Neuro and the Montreal General Hospital. These peer nominated awards are given to underscore the important work done by the nursing staff. For Helen Fong, a nursing professional development educator (NPDE) at the Montreal Neurological Institute and Hospital – The Neuro, being a nurse is all about sharing knowledge, being creative, learning through collaboration and growing together. The Multiple Sclerosis Transition of Care Team at the MUHC is making sure young patients’ journeys to adult care are smooth. Watch the video for a behind the scenes look at how the Montreal Children’s Hospital and The Neuro work together to provide the best care possible for young multiple sclerosis patients who transition from pediatric to adult care. Read Juliana Nguyen-Perreault’s story on page 9 of the MUHC’s Annual Report.